This is Buddy's 4th an final solo recording. An inspired collection of new and old tunes played as only he can. Part of Rounder's North American Heritage series. The above 10 tunes, arranged from this CD, can be downloaded as a single ABC File. First published as a two part strathspey in the mid-18th century, by 1780 The Highlanders Farewell to Ireland appeared in Robert Ross' Collection complete with 6 turns. In the 1950s Bill Lamey recorded a similar 6 turn setting. Buddy's 4 turn setting is closest to what is presented in The Athole Collection. In the Irish tradition, a 4 part reel setting circulates as Farewell to Ireland. Buddy has a fondness for pipe tunes. Willie Mackenzie's is a popular pipe reel which in The Dungreen Collection is presented as a transcribed from the playing of Donald Angus. Buddy learned The Burning House from a piece of sheet music which circulated at the Gaelic College while he was teaching there in spring 2002. Brenda had composed it a few weeks earlier for fellow fiddler Ashley MacIsaac after his home in Belle Cote had burned to the ground. "Nicole Fakoory is John Morris' niece (Genevieve's daughter) and his first Godchild. Gabrielle MacLellan is our next door neighbour who plays fiddle. She spent much time with us and of course John Morris was very aware of her love for music. When he had completed this tune he asked me for name suggestions and I immediately thought of Gabrielle". "Spin-n-Glo was written back when I lived in the Pacific Northwest, and like many of my tunes, was inspired by a fishing lure. The big winter fish that keeps fishermen salivating along the North Pacific coast are called Steelhead trout. They are more like salmon and get up to 30 lbs in weight. They are elusive, reclusive, and wiley. Fishing is done in coastal rivers, often in snowstorms. The nastier the weather the better. Bright day-glo lures seem to be consistently effective, especially if they move or spin. The Spin-n-Glo is probably the most used and popular of these lures. Its simply a little plastic bullet shape with wings, like a small propeller that rides just above a single hook, and spins and, yes, glos in the current. I caught my first Steelhead on one, and hence the tune. Boston Life is simply a celebration of all the stuff of living in Boston. Its both a statement of fact (for those who live in "The Boston States) and a dream (for those who would like to). It was inspired, as much by my decision to make Boston my home, as it was by hearing the late Herbie MacLoud's description of the promise Boston held for so many young Canadian Maritimes dreamers." Moll in the Wad is a popular 19th century Irish jig which Buddy found in 1000 Fiddle Tunes. The first two tunes were recorded together in a medley by Angus Allan Gillis in 1935. The classic strathspey The Miller of Drone was composed in the early 19th century by Nathaniel Gow. It is followed by The Yetts of Muckart, one of James Stewart Robertson's most popular compositions. Robertson is most famous as the compiler of the Athole Collection (1884). Lochiel's Rant and Pigeon on the Gate two pipe reels first recorded by Alex Gillis and the Inverness Serenaders. 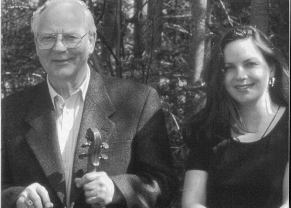 A grouping of four locally composed F jigs, the first is found in The Trip to Windsor Collection, The next two Greenberg originals are in Jerry Holland: The Second Collection and the last one is from The MacEachern Collection (Vol.1). Silverwells is one of Buddy's favourite airs by James Scott Skinner. It comes from Skinner's first book The Miller O'Hirn Collection (1880). Skinner also added the variations to Simon Fraser's strathspey, The Highlands of Banffshire. Winston Fitzgerald recorded both The Lass of Corrie Mills and Carnie's Cantor on a 78 disc. Angus Chisholm popularized The Duchess of Buccleuch. Little John's Hame is found in James Scott Skinner's most popular compilation, The Scottish Violinist. The Forth Bridge strathspey and reel was published in J. Murdoch Henderson's Flowers of Scottish Melody (1935). According to the notes in The Fiddle Music of Scotland (James, Hunter, 1979) Williamson Blyth (1821-1897) wrote these two tunes to celebrate the 1890 opening of the magnificent cantilever bridge just north of Edinburgh. Buddy met the late Charlie Sherritt during one of his trips to Scotland. Charlie published many of his compositions and Scourdiness is one of his most famous tunes. Miss Baignie Reel comes from Kohlers's Violin Repository, a late 19th century compilation by W. B. Laybourn. The Real Thing is a hornpipe found in O'Neills Music of Ireland (1903). Many Cape Bretoners associate it with fiddler Angus Chisholm. Upper Denton was first published in the late 19th century in Kerr's Collection of Merry Melodies. It was recorded by Bill Lamey. Catching Rabbits is a 20th century composition from Scottish fiddler Ian Powrie. In the 1980s Powrie's tunes were published in two small volumes. Pat Shaw composed Margaret's Waltz for Margaret Grant on her retirement in 1959 as English Folk and Country Dance Society representative in Devon. The Rosewood Jig was written for Skinner's concert agent, George Rosewood of Aberdeen. Buddy got his version of The Judique Jig from a handwritten setting based on performances Dan J. Campbell and Angus Allan Gillis and supplied by Westmount, Cape Breton music enthusiast Danny Fraser. Happy Go Lucky Clog was composed by Donald MacLean, who was Sydney Mines railway operator when Buddy worked in Sydney. 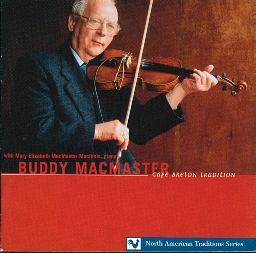 A favourite of Angus Chisholm it was later published in Jerry Holland's Collection of Fiddle Tunes (1988). The Saratoga Hornpipe and The Irish American Reel are late 19th century American tunes originating in Ryan's Mammoth Collection (1883). For this medley the fiddle is tuned AEAE. The tunes are written out in The Dungreen Collection. For the first three tunes, and for raised bass music in general, Buddy particularity remembers the playing of Hughie MacDonald. Originally from Mabou , Hughie spent most of his life in the Detroit area where he was a member of The Five MacDonald Fiddlers. The Margaree Reel got it's name in the '60s after Dan Joe MacInnis recorded it with that title. Dan Joe associated the tune with fiddlers from Margaree. The name stuck. The first two Dan Hughie tunes are amongst the most popular tunes composed in 20th century Cape Breton. Mrs. Smyth of Methven is from Niel Gow's Repository. Sandy Cameron's was recorded on 78 as a duet by fiddlers Bill Lamey and Joe Maclean. The other three are all Scottish favourites found in The Skye Collection. The first air is a modern Scottish composition. The next two 18th century strathspeys are ever-popular for stepdancing. The last two reels both have 19th century Irish origins. The current Cape Breton setting of London Lasses likely originated from Donald Angus Beaton. According to local legend the popular version of The West Mabou Reel comes from Dan 'The Tailor' Beaton.